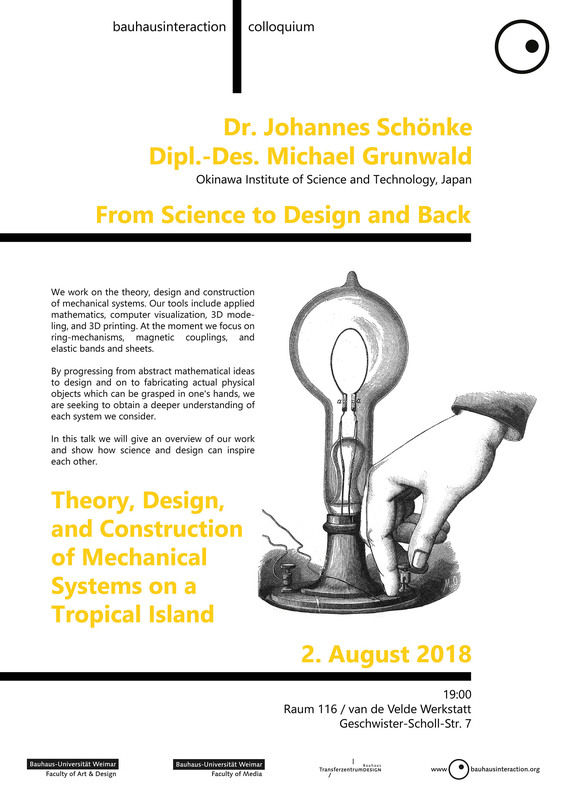 We are Dr. Johannes Schönke and Dipl.-Des. Michael Grunwald from the Mathematics, Mechanics, and Materials Unit (Prof. Eliot Fried) at the Okinawa Institute of Science and Technology in Japan. We work on the theory, design and construction of mechanical systems. Our tools include applied mathematics, computer visualization, 3D modeling, and 3D printing. At the moment we focus on ring-mechanisms, magnetic couplings, and elastic bands and sheets. “By progressing from abstract mathematical ideas to design and on to fabricating actual physical objects which can be grasped in one’s hands, we are seeking to obtain a deeper understanding of each system we consider. This entry was posted in Bauhausinteraction Colloquium, info, talks by Timm Burkhardt. Bookmark the permalink.